Like her contemporaries Patrick Nagatani and Joel-Peter Witkin, Sandy Skoglund laboriously constructs tableaux for the camera. 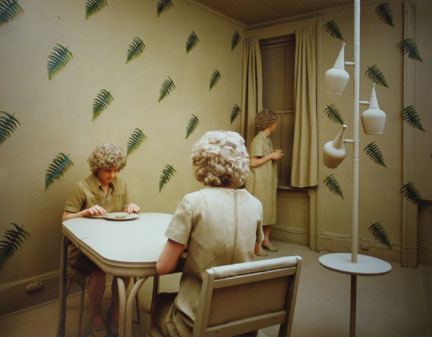 Skoglund's staged, fantastical images typically present wacky situations in color-infused environments such as a flood of orange-red foxes in a restaurant, dozens of babies dropping from the sky, or the eerie pallor that permeates "Ferns." With their unnerving proliferation of out-of-place objects, creatures, and colors, Skoglund's images open a dialogue between the natural and the artificial as they blend photography, sculpture, and installation art. Born in Quincy, Massachusetts in 1946, Sandy Skoglund attended Smith College (BA, 1968) and the University of Iowa (MA, 1971; MFA, 1972). Her photographs have been presented in one-person exhibitions at the Addison Gallery of American Art, Phillips Academy, Andover, Massachusetts; Columbus Museum of Art, Columbus, Ohio; Minneapolis Institute of Arts; and Staatsgalerie Erlangen, Germany, among other significant venues. Group exhibitions include To Be and Not to Be, Centre d'Arte, Barcelona (1990); Constructed Realities, Kunstverein, Munich (1989); L'Invention d'un art, Centre Georges Pompidou, Paris (1989); Fabricated Photographs, The Carpenter Center, Harvard University, Cambridge (1988); and the Whitney Biennial at the Whitney Museum of American Art, New York (1981).